Endodontics (root canal treatment) is necessary when the soft inner tissue, or "pulp" of the tooth becomes inflamed or infected. This may happen as a result of deep decay, repeated dental procedures on the tooth, or trauma to the tooth. 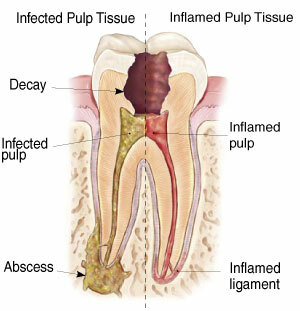 Endodontic treatment removes the damaged pulp. Then the tooth's canals are cleaned and filled to help preserve the tooth. All dentists, including your general dentist, received training in endodontic treatment in dental school. General dentists can perform endodontic procedures, but often refer patients needing endodontic treatment to endodontists. An endodontist is a dentist with special training in endodontic procedures. They provide only endodontic services in their practices because they are specialists. To become specialists, they complete dental school and an additional two or more years of advanced training in endodontics. They perform routine as well as difficult and very complex endodontic procedures, including endodontic surgery. Endodontists are also experienced at finding the cause of oral facial pain that has been difficult to diagnose. Signs of pulp damage include pain, prolonged sensitivity to heat or cold, discoloration of the tooth and swelling and tenderness in the nearby gums. Sometimes, however, there are no symptoms. 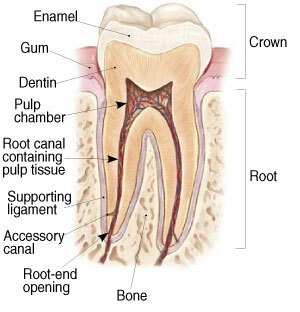 The endodontist removes the inflamed or infected pulp, carefully cleans and shapes the inside of the tooth, then fills and seals the space. Afterwards, you will return to your dentist, who will place a crown or other restoration on the tooth to protect and restore it to full function. After the restoration, the tooth continues to function like any other tooth. Endodontic treatment is a very common procedure. With modern techniques and anesthetics most patients report that they are comfortable during the procedure. For the first few days after treatment, your tooth may feel sensitive, especially if there was pain or infection before the procedure. This discomfort can usually be relieved with over-the-counter or prescription medications. Your tooth may continue to feel slightly different from your other teeth for some time after your endodontic treatment is completed. However, if you have severe pain or pressure, or pain lasts more than a few days, call your endodontist.